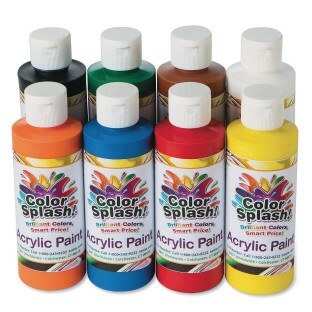 Non-toxic, fast-drying, permanent all-purpose acrylic paint in bright opaque colors. For use on canvas, wood, paper, plastic and more. Eight 8-oz. bottles per pack. Our most popular 8-color assortment: Red, Blue, Yellow, Green, Orange, Brown, Black and White. Shake Well before use. I am an activities director and we use this acrylic paint for our projects and it works great! These are really great they work on all paint projects. Great item. Bright Bold Paint that lasts! This is the perfect paint to applying to wood glass. My students loved it!